Where there’s a season 1 review, there will inevitably be a season 2 review, but if you’re waiting for a season 3 review, you’ll be waiting a long time. 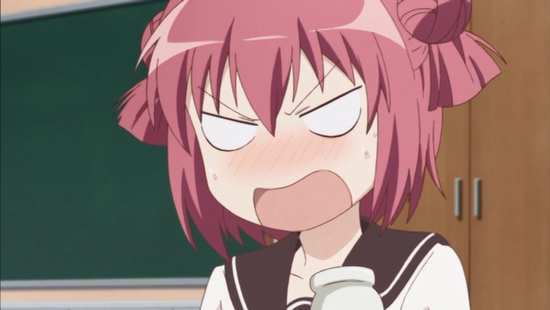 NISA who licensed the show in the US stopped releasing anime before they could get to the third season of Yuru Yuri, and Australia’s Madman Entertainment who released the show on DVD, simply ripped and downscaled NISA’s Region A locked Blu-rays. Without them, they’ll be left with the online streams to source English language materials, and while they have done so before for shows like Mushi-shi Season 2 and Rock Lee, the results haven’t been aesthetically pleasing. Season 2 continues the antics of the Amusement Club, and their interactions with the members of the Student Council. These episodes are set during the same year as the first season episodes. 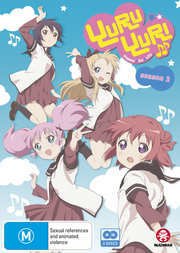 Twelve episodes of Yuru Yuri Season 2 are presented across two discs from Madman Entertainment. 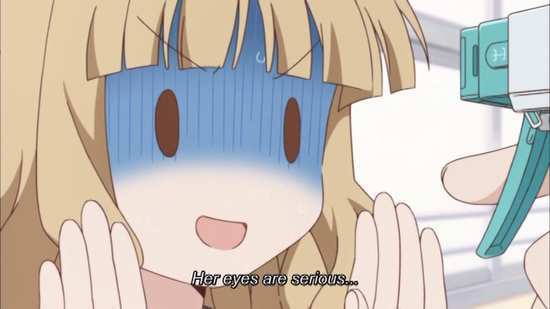 Yuru Yuri’s character designs and simple, but likeable and most importantly memorable, but the animator’s have free reign to let their imaginations go to work, to bring the show’s wacky and occasionally surreal humour across. This is a very inventive and creatively directed show. Disc 2 has the extras, and they comprise the textless credits, two of each, 2:56 of B-Side Episode Previews, and trailers for Your Lie In April, Shonen Hollywood – Holly Stage For 49, Rock Lee and his Ninja Pals, and Girlfriend Beta. What season 2 does differently is in the character interactions. 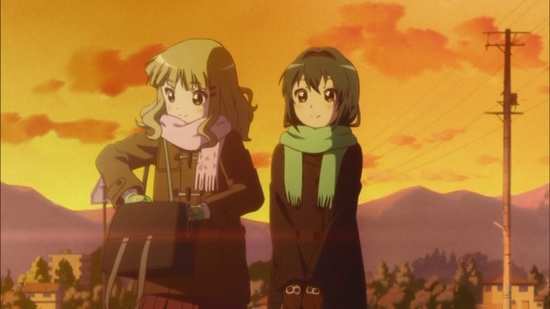 Season 1 was about the Chinatsu, Kyoko, and Yui triangle, it was about Ayano and Kyoko (with Chitose endangering her life with her fantasies of the pair), it was about Sakurako and Himawari’s love hate relationship, it was about Akari’s lack of presence. This time there’s more of a blending of characters. 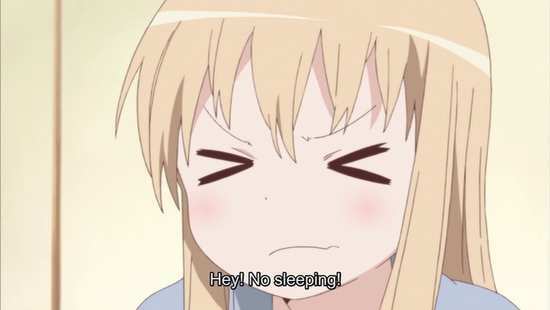 You might see an episode of Akari with Sakurako and Himawari, a story with Kyoko and Sakurako, Chinatsu with Himawari, Ayano and Yui, Chitose and Akari. Breaking the set patterns of the comedy and having different characters bounce off each other adds a lot of variety, but the disappointing thing is that the real comedy still lies in the patterns set by the first season. 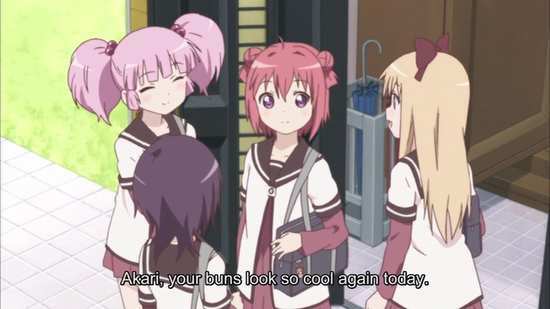 Yuru Yuri Season 2 is almost as funny as the first season, and some gags are even more spot-on this time around. It’s a little more uneven though, with a couple of gags falling flat. Worse, it also indulges that particular aspect of some anime that I just don’t get along with. 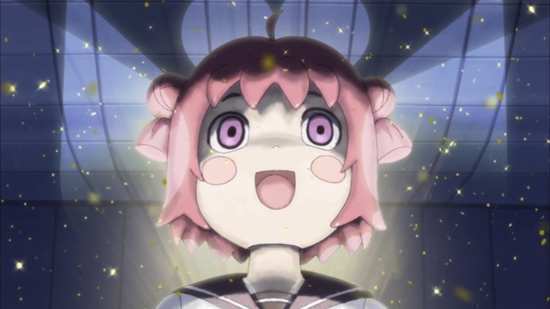 In this season, the creepy obsession that Akari’s older sister has for her has more play than the mere hint that we got in the first season. 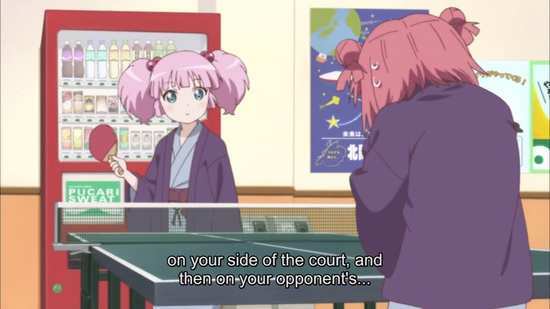 We also meet Chinatsu’s older sister, contemporary of Akari’s sister, who goes into Chitose style fantasy mode at the thought of Akari and her sister. 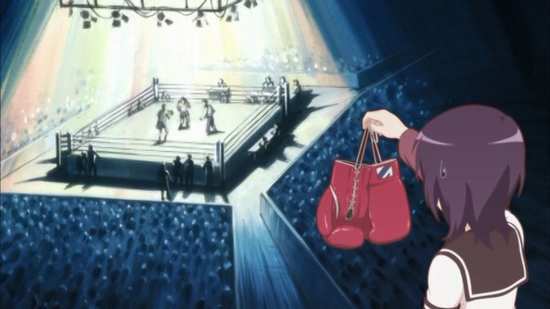 However, Season 2 does add a little something different into the mix, especially towards the end. 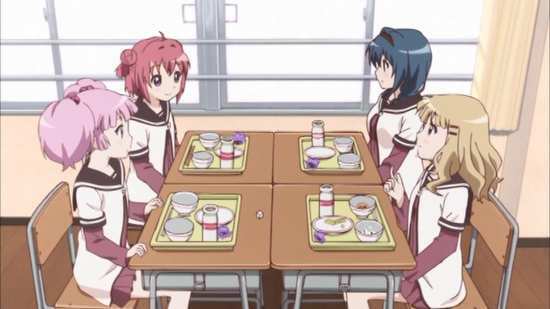 School Trip R is another look at the 2nd Year school trip that took up an episode of Season 1, only this time we get to see what the first years got up to while Kyoko and Yui were away. 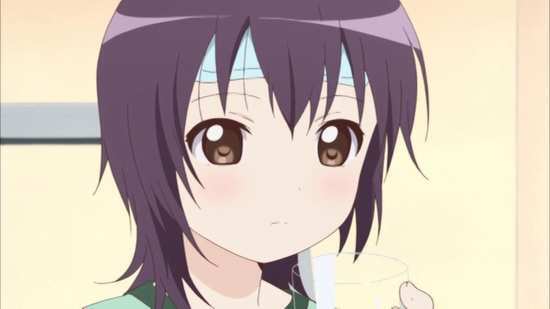 There’s also a rather touching story in the penultimate episode with Akari given the opportunity to change her personal history, so that she’d no longer be the girl without presence. The final episode is set during the ubiquitous culture festival, with the girls in a performance of Snow White. This allows their character quirks to play out to the max in a theatrical setting, and actually feels totally refreshing as a result. 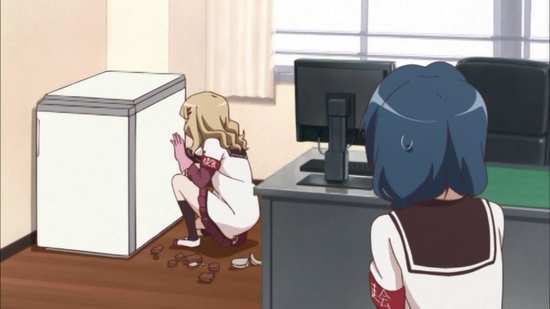 Mathematically speaking, I’d say that Yuru Yuri Season 2 was about 95% as entertaining as the first season, and that’s still really good. 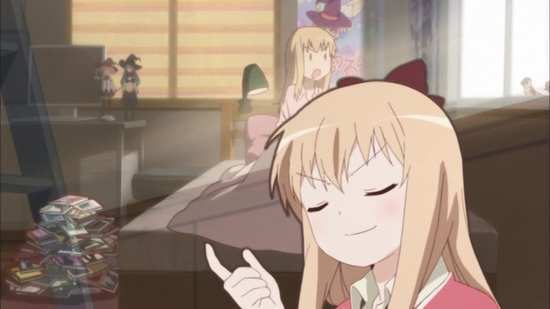 I think I’ll head off to Crunchyroll now to watch Season 3 again, as long as they hold onto the licence.